Celebrate your engagement with us before June 30, 2019 to take advantage of our exclusive engagement party offers. Find out more using the buttons below. *A maximum value of $200 supplied by Tacking Point Tavern. Value supplied by Tacking Point Tavern does not contribute to the minimum spend. Our Captain’s Lounge contains all the features you need to make your engagement party a night to remember! The Captain’s Lounge is your own private room available for exclusive hire. Features include HD televisions for slideshows and media, microphones for speeches, and the choice to have your own entertainment. Make the most of Port Macquarie’s great weather. This function space lets you take full charge and be your own exclusive host. Perks to The Deck include the freedom to customise your own styling and themes, music, furniture, and play your own slideshows through a mobile screen – plus, there’s no cakeage! Tacking Point Tavern’s little slice of paradise - this open outdoor function space is the perfect spot to host an engagement party of any size, from a crowded cocktail party to an intimate gathering with friends. The Beer Garden is not only Port Macquarie’s ultimate place to grab a brew while watching a game, but a great casual function venue for engagements. You also have the choice to play your own media through the big screen. Celebrate your engagement with friends and family at this classic coastal venue. 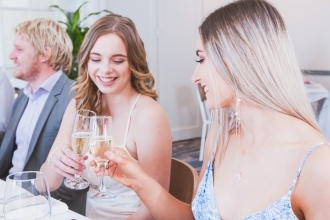 Tacking Point Tavern has everything you need to host the perfect engagement party featuring three unique functions spaces, a range of food and drink packages, and friendly staff that are excited to help you celebrate your big news. To start planning your engagement party at Port Macquarie's favourite venue, please complete the form below and a member of our team will be in touch. © TAPHOUSE GROUP. ALL RIGHTS RESERVED.